Katie Fallon is a nature writer, educator, and wild bird rehabilitator. Her nonfiction book Cerulean Blues: A Personal Search for a Vanishing Songbird (Ruka Press, 2011) was a Finalist for the Reed Award for Outstanding Writing on the Southern Environment, and her essays and articles have appeared in a variety of magazines and literary journals. She has taught writing at Virginia Tech and West Virginia University, and is a founder of the Avian Conservation Center of Appalachia. Bill Wilson is the co-founder of Birds & Beans® Coffee and a consumer-marketing expert with over 30 years of domestic and international experience. Birds & Beans® Coffee is the only coffee brand in the US that solely roasts Smithsonian Migratory Bird Center 'Bird Friendly®' certified beans, 100% shade grown, organic and Fair-Trade certified coffee. The enterprise is a for profit conservation business aimed at helping stop songbird population drops. Birds & Beans conservation partners include the Cornell Lab of Ornithology and American Bird Conservancy. Wilson founded and was CEO of the London based ECM Group. Prior to the ECM Group, Wilson capped a fast track career in the advertising agency sector by serving as the Executive Vice President of BBDO International. He currently lives in Boston with his wife. Leigh Anne Carter is a freelance illustrator. After traveling to California to pursue an education for science illustration, she moved back to Charlotte, NC to share her work with the city in which she grew up. She has recently finished illustrating bird species for a future publication of The Birds of Mecklenburg County, sponsored by the Mecklenburg Audubon Society, and she is involved in local conservation efforts and education. Visit her at www.lacarter.com. 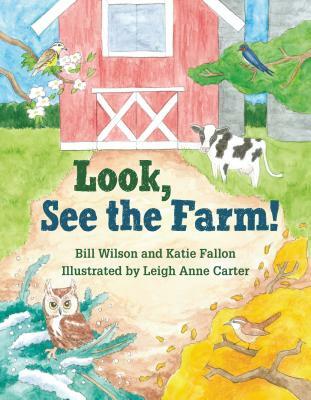 "Featuring a universal message and an enduring appeal, Look, See the Farm! is an exciting, instructive, and entertaining journey be the start of a newfound appreciation for nature's beauty!"